Part 1 of my series of Iron Maiden reviews! I do not own this EP in its original form, unfortunately. I probably never will — there were only 5000 made, independently. Maiden were one of the first metal bands to release an indi EP, and among the most successful. For now I’ll have to be content with the CD bootleg that I have, which is called The Soundhouse Tapes and More. It’s a physical format, at least. I think Trevor snagged this one for me, at his store. 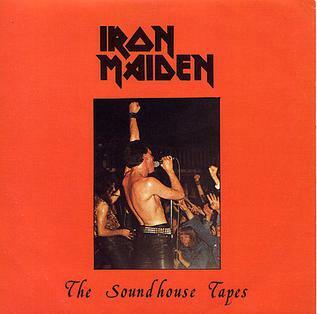 The Soundhouse Tapes was Maiden’s first official release, a 3 song limited edition. Guitarist Tony Parsons had just left the band and Maiden did the EP as a four piece: Founder Steve Harris (bass), longtime guitarist Dave Murray, Paul Di’Anno on vocals and drummer Doug Sampson. It sounds essentially like a well recorded demo. The songs lack the energy, speed and fire of their live counterparts, but they are flawless blueprints. “Prowler” is present with all its components intact, but without the cocky breakneck pace. It sounds like Maiden were warming up, and perhaps in a sense they were! “Iron Maiden” and “Prowler” made the first album, and I probably don’t need to tell you how awesome these songs are. These versions are inferior, but having said that, they still smoke most of the NWOBHM releases of the time. “Invasion”, a somewhat lesser song, was destined to become a B-side later on. Steve would revive the subject matter (the Norman conquest of England) and some of the lyrics later on too…. A fourth song, an embrionic “Strange World” with prototypical solos, was recorded but left unreleased for the next 17 years. It finally came out on 1996’s Best Of The Beast. As an added bonus to vinyl collectors, Best Of The Best contained a reissue of the entire Soundhouse Tapes, but only if you bought vinyl. Which I had the opportunity to do, but not the balls to spend that much in one place, and I blew it. This remains the EP’s only official reissue, and will remain so for the forseeable future. I will be following along as Mike posts these Maiden albums – I am fortunate to have access to them all – maybe not the boots and that, but most of the official stuff. At least, I think so. Knowing Mike, he’s got a ton of things I’ve never heard of… anyway, I’ll join in when I can. I’m stoked! Let’s do this! One small caveat before I begin: I only know Maiden’s hits (and there are many). I did not grow up listening to these guys (I was the jazz kid). I am not as deep into them as you guys are. So I won’t have the same perspective, but maybe I can add something fresh? We’ll see! Iron Maiden is as much metal as it is punk. It has that same raw energy and screamo-vocals. I loved this! Mike says this is an inferior version, but I like it rough like that. Long live this demo version! In fact, you say it made an album – I wonder if it’ll lose some of its beauty when it gets prettied up in a studio. We’ll see when we get there. Invasion is also awesome! They’re incredibly tuneful and (yes, I’ll use that word again) raw at the same time. I’ve heard, hell I own official releases of 70s punk that don’t sound this good. Mike, a “lesser track?” Ha! Damn, this is a fantastic track! Prowler… now this sounds more like the Maiden I know. But that guitar doing the snaky melody line… it’s out of tune! At least, to my ear it is. My ear wants to follow the chugging rhythm guitars but it keeps getting pulled back to the one that’s slightly off key. Anyway! When it breaks down in the middle and then takes off like a rocket WOW! This is awesome! If I owned a record label, and I received this demo, they would be signed immediately! And I say that not knowing what they would one day become and were capable of – I mean based on the strength of these three very primal tracks, they’d be signing up post-haste. Hot damn! Ahh hell I do have one more thing to say. Keep in mind that two key members of Maiden were yet to join. One of them, according to Bruce Dickinson, was “the best drummer Maiden ever had.” And the guitarist was no slouch either. I had a listen to this today for the first time in ages… It was weird to hear how inexperienced they sound and it’s not quite the real deal yet. You can definitely hear Punk in this (especially Invasion) despite what Steve Harris has to say! The song Iron Maiden seems the most well-formed and recognisably Maiden-like! The do seem to miss the input of another guitarist. There is plenty of warts here – Prowler is a bit out of tune. Invasion is a bit too busy and has some lyrics Bad News would have been proud of! (It also has an oddly Joe Perry-esque solo.) It’s easy to see why that didn’t make the cut for the debut album despite it being quite pacy. But, despite all the amateurism and flaws… it’s amazing! I thoroughly enjoyed it. It’s got so much energy and vibe. In a way it kind of sums up the appeal of the NWOBHM in a nutshell! I’ll definitely be going back to this. Great review and a great start to the series. Loving it already! I knew you’d have extra stuff. Bring it on! I have to admit that I haven’t listened to much Iron Maiden. Your series is impressive and I already know that I’ll enjoy reading. Thank you! Never too late to start with Maiden especially when the new album due in September. I’ll probably do some revisiting of old Maiden around then too. A shame that the studio version of Prowler lost that awesome mid song scream.